I remember the first time I started an intravenous (IV) in a patient. I’d practiced many times on the “lab hand,” a plastic/rubber hand with “veins” and red liquid that represented blood, but doing this on a real person is nothing like practicing on the lab hand. Starting your first IV is nerve wracking – having an instructor watch your every move even more so! Inserting an IV isn’t technically difficult, but every patient is different. Their veins may be difficult to find or may move around as you start the IV. Some patients are so anxious and upset that they tense up and move, making it even more difficult for a smooth procedure. 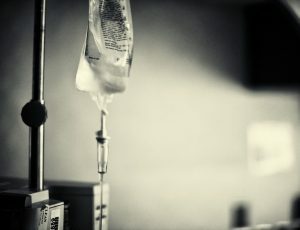 Getting an IV is often a stressful experience. It’s an invasive procedure that can hurt, particularly if your veins are tough to find or you have to have multiple IVs. But as uncomfortable as they can be, IVs are a vital part of many treatment plans and they save lives. Most nurses can start IVs well, but it’s a specialty for infusion nurses, or IV nurses. Their job is focused on ensuring the right IVs or infusions are started correctly in the right patients. The nurses are also responsible for ensuring the IVs run properly, monitoring how patients respond, trouble shooting infusion-related problems, and discontinuing the infusion after the treatment is finished. January 25th is IV Nurse Day in the United States. Established in 1980, the observance was initiated by the Infusion Nurses Society to help support the nurses who work in this specialty. A day dedicated to IV nurses helps promote the specialty and recognizes that IV nurses follow specific continuing education, advocacy, and professional development related to infusions. The Infusion Nurses Society has over 7,000 members world-wide. Infusion nurses work in acute care settings, but they also work in home care, clinics, offices, infusion centers, and long-term care. They are often the first-line and most consistently present healthcare professionals encountered by patients and their families. This position makes them well placed to identify infection and possible sepsis, and to help educate the public about sepsis. An IV may be small and routine, but when an IV is inserted, there is a break in your skin. Any time there is a break in your skin, there’s potential for infection, something IV nurses are always watching for. And since IV nurses can’t be around their patients 24 hours a day, by teaching patients and caregivers about the signs and symptoms of infection and sepsis, the nurses empower them, allowing them to be part of their own care. There’s a sense of satisfaction when you successfully start an IV and you see your patient getting the necessary fluids and medications. There’s also a sense of satisfaction in noticing if there are problems and jumping into action to prevent complications. Infusion nurses do this every day. Sepsis Alliance salutes infusion nurses for all the work they do and thanks them for being sepsis advocates. To learn more about how invasive devices like IVs can cause an infection leading to sepsis, visit Sepsis and Invasive Devices, part of our Sepsis and… library.